When I say 2 channel, the trend for trying to squeeze as much as possible from the controls continues, as the Terminal Mix 2 is still a 4 channel controller. But outside of that, this does look like a simple hacking away of 2 hardware channels, and retains the same basic layout of its bigger sibling. And in doing so, the addition of Serato's DJ Intro software will finally make sense for people. Unlike the Terminal Mix 4, it loses Virtual DJ LE and instead comes with 4 deck mappings for Traktor. Given that DJ Intro isn't a 1 to 1 mapping protocol like ITCH, it'll be interesting to see which controls aren't used. Having already felt DJ Intro's control responsiveness in other units, the Terminal Mix 2 could well be a winner for Reloop. 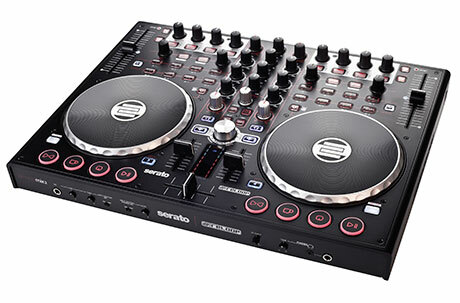 With the Terminal Mix 2 Reloop complements its Serato controller series by a dedicated 2-deck variant. Terminal Mix 2 disposes of an integrated 2 channel mixer that besides 3-fold EQ with intelligent kill technique* also offers gain and filter modulation per channel. The crossfader curve can be adjusted comfortably on the device's front side. In addition to the popular Trax Encoder, the master section is now equipped with four convenient management buttons which allow direct access to playlists, crates or further layout views without the need to touch your laptop. This means a desired track can be located and loaded instantly into any deck via the designated load buttons - a fader start* function can also be activated if desired. As a further highlight, Reloop has developed brand new ultra-flat aluminium jog platters which with an impressive XXL diameter of 15.5 cm have also been enhanced with a non-slip vinyl-grip coating for even more control over your tracks. With a total of 3 modes (Pitch Bend/Vinyl/Quick Search) it's possible to easily switch between pitch correcting, scratching, or browsing through tracks on the fly. Trigger Action Deluxe: The entire transport section is fully equipped with rubberised buttons which offer a comfortable pressure point whilst also being extremely durable. The performance section* features an extensive 8 button layout which can be utilised over 2 separate layers for true versatility. On the first layer 4 hot cues can be fired off and 4 sample decks can be triggered simultaneously. Depending on the software used, other creative possibilities are available, for example the option of accessing hot cues/samples 5-8 on the second layer - or with future software updates this section can be enhanced even further with brand new performance modes (Cut'n'Slice) for live remixing. The extensive FX section is equipped with 4 buttons, 3 rotary knobs, and 1 endless encoder to provide even more creative possibilities in the mix. The smart loop section also features 4 independent controls allowing users to quickly set beat-precise loops, adjust the size of the loops and even move the loops whilst in a live situation. Reloop also listened to the requests by many DJs and for the first time has integrated a 14 bit pitch fader with 100mm increments, allowing ultra-precise mixing and blending. Power House Interface: The audio section offers a vast array of connecting possibilities for your master PA (including balanced output jacks), a zone function and a DJ booth system. Also very practical are the 2 headphones connections (6.3 mm & 3.5 mm) which can be adjusted with a 1- band equalizer. A microphone connection with a 1-fold EQ for MCs, hosts or singers has also been integrated and can be adjusted via a flexible routing switching system. Furthermore, it's possible to connect a turntable, CD/MP3 player, or iPhone/iPod to the Aux input which can be routed to the master or even software! Terminal Mix comes 'plug and play' ready with Serato DJ Intro. Traktor Pro 2 mappings are also available. Check in at Terminal Mix 2. *Some features are only available with a software Pro version. 2x 15.5cm touch-sensitive, two-part jog wheels for scratching, cueing, etc. Hats off to Reloop. The trend is to extract the largest sum of cash from the end user by pressing their gear acquisition button hard via a 4 channel unit. And then when they realise that they never needed 4 channels after all, they sell it and source a more suitable 2 channel one. Now, potential buyers have the choice from the get go. I like that. Let's see if it pays off for Reloop. I cannot help but notice the iconography on the buttons. Obviously, the cup button engages a cup holder that extends either side of the unit, but the button to the right - I can only assume that it's a fart button because of its startling similarity to an arse... I jest of course - it's the fartcue button. I will say this about Reloop controllers - they're heavy, solid and chunky. I've never really understood the need to deep wheels on controllers, and love these low profile large ones. All the controls beg to be grabbed with both hands rather than wondering if you'll be able to squeeze a finger inbetween knobs or not. I continue to be concerned with just how much is being crammed sardine style into a small space. I keep saying it and have been for years - modular. Manufacturers - start thinking separates and how they can all meaningfully talk to each other. But anyway, I'm guessing that we'll know more about price and availability the nearer we get to Musikmesse, which uncharacteristically I still haven't booked. When I first saw that little cup I got so confused. After I figured out what it was I had a good chuckle. I don't like Reloop and chances that this will change are on the lowest level possible. The have some really cool products in their line and always had but their PR makes me hate them. Read their description. Not only once they do mention "DJ Intro" because they know people say "Serato" if they're talking about Scratch Live (or sometimes ITCH) but never DJ Intro. This is fishing for noobs. That's just not right. Why not be honest? This is a good two channel controller. It comes with the newest mixing tool from one of the leading DJ software companies: DJ Intro by Serato. See - not one lie! This time they actually do mention DJ Intro 2 times and Serato (without DJ Intro) 3 times.